Hugo is a Play ‘N Go-powered video slot with 5 reels and 10 paylines. As with all their other titles, it can be played on desktop, tablet and mobile compatible devices – this time from 10p to £100 per spin. This cartoon game is based on a friendly little troll that is famous in Scandinavian countries and has appeared on television shows and video games – a feature film is being produced too for release in the near future. This quirky game sees you searching for treasure and trying to rescue Hugoline (who is Hugo’s wife) from the powers of evil. There are 13 symbols on the reels with 5 lower value playing card symbols and 4 higher paying symbols – these include pickaxes, dynamite sticks, golden nuggets and bags of gold. You will also see Hugo and Afskylia who is the evil witch. Hugo is naturally the wild and substitutes for all other symbols with the exception of the scatter and bonus symbols. Even better is that your win total will be doubled if the Hugo wild is part of a winning combination. On to the bonus features – you have the Treasure Bonus feature which is triggered when the treasure chest scatter appears simultaneously on reels 1, 3 and 5. Here you will come across a gold mine of which you have to open doors. The further you go, the bigger the rewards on offer with up to 500 times your bet to be won – look out for Don Croco (who is the Crocodile Henchman) as he can appear from behind a door to end the feature. The good thing is that you can retrigger the feature if 3 or more Evil Witch Afskylia scatter symbols show up during the feature. Look out for the Hugo wild as he will continue to double your outcomes! 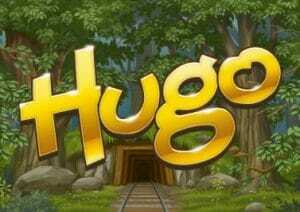 Fun and friendly, Hugo packs quite a punch though as there’s a potential 10,000 times your bet to be won on every single spin – the variance is in the middle with my biggest wins coming from the free spins. Saying that, I do believe Play ‘N Go has produced better video slots with the Day of the Dead-themed Grim Muerto and the ancient Egyptian themed Rich Wilde and the Book of Dead worth trying.